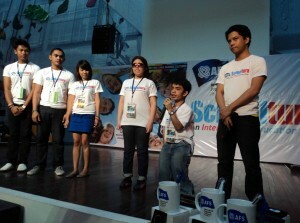 AFS Iskolar na May â€œKâ€, Marlon Celso shares his AFS year in Michigan, USA as a goodwill ambassador AFS â€“ YES scholar during the AFS Schooltura â€“ An Intercultural Education Expo last July 24-26, 2010 at Glorietta 3 Mall, Makati City. Beside him is another PWD AFS Returnee Ms. Maria Adisa Nahil (3rd from right). Marlon and Adisa wowed the audience with their accomplishments notwithstanding their disabilities. Marlon is now call center supervisor due for another promotion, while Adisa is an RBI scholar and one of STI-Cubao’s achievers. People should start now to learn to appreciate the people or persons with diasability as a member of our society, they should think of them as their equal, who like them have every rights to live a normal and peaceful life in our community, they should help and encourage persons with disability to strive to better their lives and be productive members of our society and to be actively taking a part in the community.